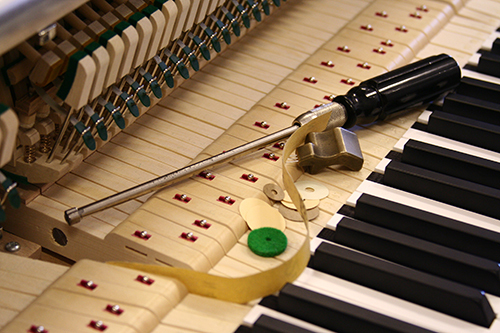 We offer a professional piano tuning service with an appointment system ensuring regular high quality tuning and maintenance. Pianos benefit from regular tuning to combat the changes in pitch predominantly brought about by changes in temperature and humidity. Most pianos in domestic situations will need tuning twice a year. During a tuning visit we will make minor adjustments to regulation and voicing and carry out minor repairs if required. We will offer advice on the condition of the piano and make recommendations accordingly. Our piano tuning round is maintained by Ben, Vicky and Richard. Ben still thoroughly enjoys the piano tuning life and fits in as much as possible alongside the running of the showroom. Vicky has been tuning regularly for us since 2006 and Richard since 2010. Both work with great skill, enthusiasm and enjoyment in their work. Ben is a qualified member of the Pianoforte Tuners Association and continues to attend advanced technical classes to develop skills and learn new techniques. 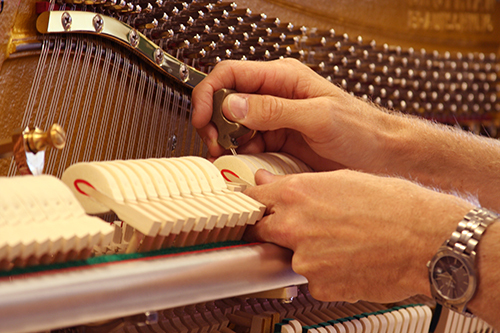 To arrange a piano tuning visit please contact us. We are always pleased to visit new customers and build a trusting relationship to ensure the best care for your piano.